Being the world leaders in their respective sectors, Roca and Armani decided to bring together an extraordinary bathroom experience into reality. The Armani/Roca collection consists of numerous exclusive bathroom products that combine ultimate luxury and solid practicality in a graceful and effortless way. With the aim to design the elegant and comfortable bathroom for the contemporary home, the two companies put together their innovation, technology, and experience to create a harmonious space that allows you to rewind your mind and body every day. This beautiful collection includes a vast diversity of sophisticated products and accessories, including bathtubs, washbasins, toilets, faucets, mirrors, furniture and even tiles. Products are available in various sizes and colours, to fit the specific needs of your bathroom space. 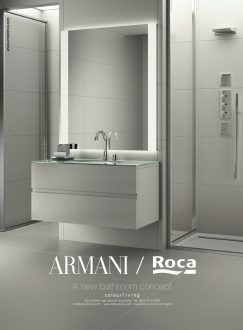 Apart from the gorgeous look and the finest quality, the Armani/Roca collection also fulfills all your requirements in the functional aspects, to create for you an incredible bathroom space of comfort and beauty. The Armani Bathroom Concept gives us a revolutionary idea what a bathroom of the 21st century could be.